So, it is raining cats and dogs, and there is nothing more that you would like to do than to remain cooped up in the comfort of your nice, warm and cozy home, sipping on a cup of hot chocolate with some marshmallows along the way. Of course, during the sweltering summer months, it would be the other way round – you would wish that it will start pouring as the heaven open up their floodgates, and an ice cool drink is what you need exactly. 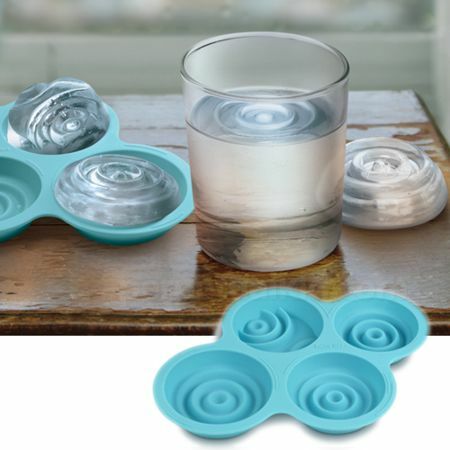 Why not have a semblance of rain falling down onto your drink through the $9.99 Rainy Day Ice Cube Tray? It makes your ice cubes look as though there are ripples, as though your drinks are caught out in the rain – until they melt, of course.